I attended an evening of Sufi Sindhi music organized by The Kabir Project – the evening was a wonderful experience to say the least. Shah Abdul Latif Bhitai (1689-1752) is one of the greatest Sufi poets along with Rumi (1207-1273) and Mir Dard (1721-1785), but relatively speaking lesser known. His poetry draws on the power and beauty of Vedanta and Islam melding the two philosophies into one poetic and spiritual vision. His major work is the “Shah Jo Risalo” and his poems thrive today as a vibrant oral tradition being widely sung, quoted and loved by both Hindu and Muslim communities in the Sindh region on both sides of the Indo-Pak border. He takes the popular love legends of the region and speaks through the voices of different woman protagonists. Sometimes he is Sasui, sometimes Moomal, sometimes Sohini and sometimes Marui… and through their journeys of seeking the Truth he expresses his own. His poetry creates a tantalizing dance of expressions between the sensual yearnings for the earthly Beloved and the deeply meditative yearnings for the transcendent Beloved. What made the event outstanding was the organization – the music was completed by a sampling of Sindhi cuisine, including their samosas, tosha, daal and halwa. There had souvenirs available in the form of t-shirts and books. The artwork and the presentation playing in the background was absolutely fascinating. Shabnam Virmani, as the emcee weaved a number of stories and kep the audience enthralled. even the sign boards to the venue said, “Seeking the Beloved? … This way”. The only comment would be that the second part (Waee music) was probably not very mellifluous and for popular consumption. While the authenticity of the experience is very important, the organizers should have kept public taste in mind. 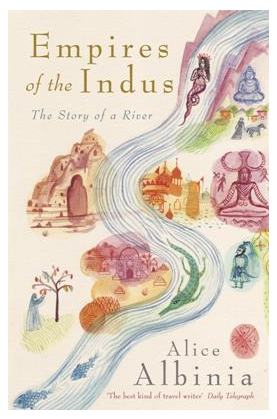 The book is an absolutely mesmerising journey of the author along the Indus, in geography and in time. It’s an enthralling read – both in substance and in style, and if you are a travel, history of even politics buff, you should not miss this book. Albinia was a journalist in Delhi when she got the idea of the book – she went back to pursue an M.A. in South Asian studies to get the book in place, and what an effort it has been. Alice starts at the mouth of the Indus, where the river empties itself in the sea, and moves up – over its now dry delta, over the stories of the migrants from Africa, over the temples and masjids of Sufi Saints and Zindapir, over Guru Nanak’s legacy, surviving the Khyber Pass, recounting the spread of Buddhism, experiencing Alexander’s war path, juxtaposing the richness of the Harappan civilization with the poverty of today, the solitude and StriRajya of Laddakh on the Indian side, right into the source of the river – Senge Khabab (the Lion’s Mouth) in Tibet. All through Albinia comments not only in the rich history of the river, the giver of lives, the source of power, the epicentre of business, and the thoroughfare through which innumerable invaders entered India – however, the way she juxtaposes the richness of the past with the destitution of the present, both monetary and cultural is what makes the book unique and brilliant. The source of the mighty Indus is tamed by numerous dams, its humongous delta now finds itself constricted, parched and impoverished, its verdant cultural and religious heritage is now restricted by the penury of current civilization. She laments the loss of culture, the wondering history of over 50,000 years that is being used as bricks in construction sites, the multi-religious tolerance of thousands of years which suddenly in the span of half a century is now under threat. The book is a travellers treasure – all through Albinia has stayed with the locals, conversed with them, eaten with them, sat in their hujras (male guesthouse outside the house), worshipped in their dargahs, drank their majoon (herbal intoxicating confection), celebrated their festivals, lived their life. Her understanding and appreciation of the local culture and language is surprisingly accurate, her enthusiasm for going beyond the boundaries of safety in order to explore the river’s heritage, the hidden stories and poetry is laudatory – I salute her courage and her erudition. Thou knowest and seest all things. PS: For those who might wonder, this review and blog post comes after a really long time – life’s been crazy lately, but a good kind of crazy.